Rangefinders are now part of the game and they are one of those things that every serious golfer must have for success when on the course. But, finding a good one is even more important as there are many models in the market. 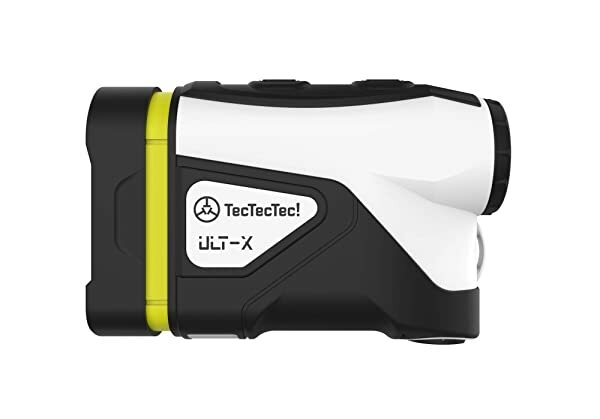 However, the TecTecTec ULT-X rangefinder is one of the best you can get anywhere as it has some very impressive features. Rangefinders are now part of the game and they are one of those things that every serious golfer must have for success when on the course. But, finding a good one is even more important as there are many models in the market. 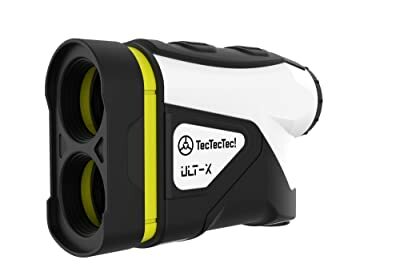 However, the TecTecTec ULT-X rangefinder is one of the best you can get anywhere as it has some very impressive features. These features include Slope Switch Technology, Pinsensor with Vibration, Target Lock and 6X magnification. Also, this is a highly accurate model and when you buy it, you also get a free case and battery. Slope Switch Tech: With this rangefinder, you can take the slope into account when calculating distances to ensure you get more reliable measurements. Also, the feature can be turned off to make this a tournament legal device. Magnification: With a magnification of 6X, this rangefinder is designed to ensure that you always get bright and clear images regardless of the prevailing weather conditions. Pinsensor with Vibration: Pinsensor technology makes it easy to locate and lock onto the flag, and this is regardless of whether there are other overlapping targets or not. Also, there is a vibration alert that will make it easy to tell when you are locked onto the flag. Range and Accuracy: You can use this rangefinder to measure up to 1,000 yards which should be more than enough for any typical golfer. But the high level of accuracy is the best element about it as it maintains an accuracy of +/- 0.3 yards for 300-yard measurements, +/- 0.5 yard for 600-yard measurements and +/-1 yard for 1,000 yards. Weatherproof Construction: This rangefinder is designed for use in any weather as it features a rainproof and moisture-resistant casing that will keep water, wind, and dust out of the rangefinder. Accuracy is the biggest benefit that you get when using this rangefinder as it is designed to be up to an impressive +/- 0.3 yard when you are 300 yards away and +/-1 yard when you are 1,000 yards. Also, the fact that the slope function can be switched off to make this a tournament legal rangefinder is also a huge benefit. A good rangefinder is one that not only provides accurate measurements but also clear and bright enough images as this is what you need to ensure you always get reliable data when on the course. With this TecTecTec rangefinder, this is exactly what you get, and this should be enough reason to try it out. But there is still more to it as it also has high-quality magnification and a weatherproof construction to make it ideal for use in any season. Other things like the fact that it is tournament legal and that it comes with both the battery and a free case should also convince you to try it out. And there is almost no shortcoming with this rangefinder besides minor things like the white patches staining easily. Hence, the bottom line that this is a top-notch product that you will not regret buying. I am Brian Jame, a property dealer. I love playing golf and have over 15 years for this game. As a member of GolfLover and Lasergolfrangefinder.com, I am willing to share experiences and tips/tricks to improve your golf game as well as provide golf equipment buying guides and reviews.